A walking tour of the dynamic DUMBO & Vinegar Hill neighborhoods of Brooklyn. Come explore the Brooklyn waterfront neighborhoods of DUMBO and Vinegar Hill. DUMBO was once the center of Brooklyn’s industrial era and later a thriving artistic community. Vinegar Hill was, in the mid-19th century, the “Five Points” of Brooklyn. Our walk combines the history, architecture, people and contemporary gentrification of these lesser-known neighborhoods. 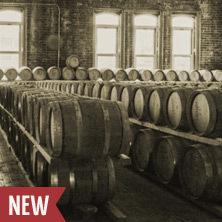 Stops could include the Eskimo Pie factory, Brooklyn’s “Gracie Mansion,” historic Fulton Ferry, Brooklyn Bridge Park, and sites associated with George Washington, Walt Whitman, John Roebling, Jean Nouvel, the 1870s Whiskey Wars, and America’s oldest national chain store. Customized option for private tours: Consider a walk across the Brooklyn Bridge and into DUMBO for a unique two hour walk. Please call us at (212) 439-1090 ext 3 or email us for more information or to arrange. SE corner of Jay St & York St, next to the York St F train station. 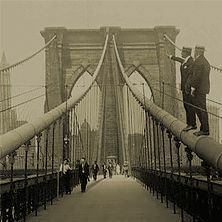 A walking tour across the Brooklyn Bridge and into the city's first landmark district.